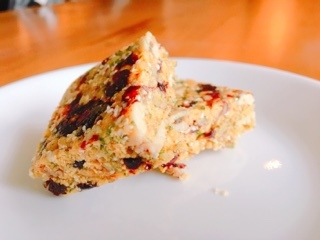 I’m particular with granola bars – I don’t like when the main ingredient is granola and they’re especially bad if the bar’s really sugary. Hence, most of the run-of-the-mill boxed varieties found in supermarkets were never appealing. Over the years, I’ve found brands that remove some grains and replace it with additional fruits and nuts, cutting down on the sugar also helps. 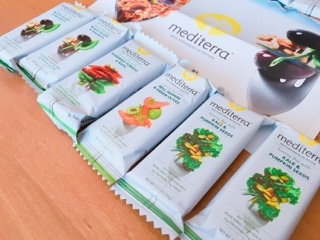 It wasn’t until recently that I’ve discovered Mediterra bars, which has an entire savoury line inspired by the Mediterranean diet (think greens, whole grains, olive oil and olives). By far my favourite is the kale and pumpkin seeds, milder in flavour compared to the ones packed with olives, sundried tomatoes or capers, but nonetheless extremely satisfying as an add-on during lunch or a snack to tie me over until dinner. The bar was chocked full of hearty ingredients including cashews, pumpkin seeds, crispy kale bits and dots of apricots to give it chewiness. 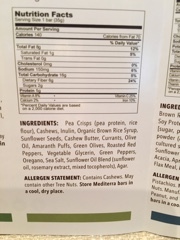 In lieu of granola, Mediterra incorporates pea crisps (a blend of pea protein and rice flour) and some amaranth puffs for crunch. 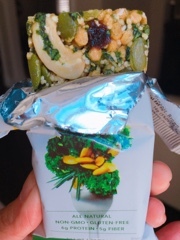 I’ll admit, the first bite was a bit strange as I’ve always associated food bars with a sweet taste. But, for a person who yearns for chips in the afternoon, the sea salt, olive oil and rosemary helped satisfy the craving. Of course, Mediterra also offers the traditional sweet varieties. The yoghurt and oat bar with cherry or apricot has the sweet glaze on one side, but isn’t as sugary as the popular grocery store brands. Adding pistachio to the blend was a good choice as it’s a mellower nut. If you’re craving something even sweeter, the pistachio and honey one is indulgent enough to replace a doughnut or cake. 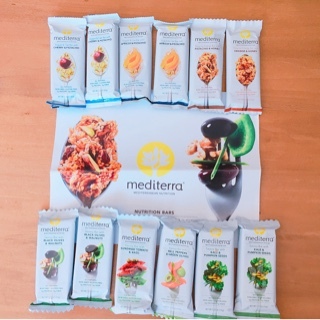 Mediterra modelled their sesame energy bar line after the Greek pastel. Like the sesame seed bars, there’s a honey binder except the consistency is chewy and soft. Considering an average doughnut is about 500 calories, the fact that the bar’s only 200 makes it a healthier alternative. Finally, a brand that makes a savoury food bar. If you want to try some for yourself, Mediterra is offering Gastro World readers a discount code to receive 10% off their online order until January 31, 2017. Just head to MediterraNutrition.com and type in SAVE10 at the checkout (please keep in mind it’s a US company).